The UUK proposal is a big step forward from the 23rd January decision. Our industrial action stopped the employers imposing a Defined Contributions scheme and they have begun talking about a potential solution. But this deeply ambiguous proposal commits them to nothing – it is effectively an agenda for a series of meetings, not an offer. UUK pledge “a pension broadly comparable with current arrangements”. The letter of clarification from UUK’s chief executive says it “does not intend to return to the January JNC proposal to consult on moving to a DC scheme”. But these vague statements, which UCU negotiators had no opportunity to question, carry no guarantees. Indeed, they are the same phrases that we’ve heard before, in relation to the January proposal and the March proposal. UUK are on the defensive and can be forced to concede more. To accept the current proposal as it stands would concede our advantage, allowing them to regroup and return to attack us again at a later date. We have seen two substantial degradations of our pension scheme in the last decade. There are many in the union who want to demand a commitment of no further detrimental change (a ’no detriment clause’) for the current valuation round (i.e. until 2022). This would enable a period of stability that would benefit employers, staff and students. Other commitments short of such a clause are also potentially achievable. So if you favour a ‘revise and resubmit’ position, you should also vote no. We need clear timescales for the expert panel. The panel should report by a specified date, early enough to influence the outcome of the current valuation. It should then discuss the underlying methodology and form recommendations on how it sees the future of valuing USS, in time to influence the 2020 valuation at the latest. With so much information flying about, we’ve been asked to further clarify the difference between the ‘no detriment’ position and the ‘revise and resubmit’ position. 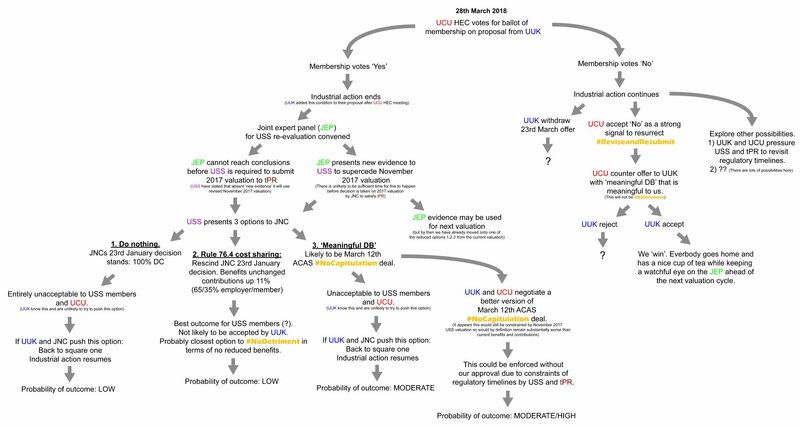 Both positions hold that the UUK proposal is a good start, but not enough. Both positions hold that the UCU negotiators should be involved in producing a revised, clarified offer. Those who support the ‘no detriment’ position want to see the inclusion of a clause that says there would be no detrimental changes to our pensions (either increases to member contributions or reductions to benefits) before 2022 when the next valuation would take effect. It’s important to realise that it is not a ‘no detriment forever’ position. Some of those who favour a ‘revise and resubmit’ position want clarification of terms such as “broadly comparable” and “meaningful element of DB” effective until 2022, and would not rule out small but limited increases in member contributions or reductions in benefits. Both positions require a no vote. This is a graphic map posted by Adam Errington on Twtter, illustrating some of the possible outcomes of both a yes and no vote.